Potato Gnocchi is a traditional light and smooth textured little fluffy potato dumplings, made for centuries throughout the kitchens of Italy. Traditionally gnocchi are served with tomato sauce, pesto and melted butter and cheese and are typically homemade in Italian and Italian-American households. 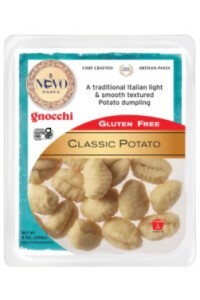 These gourmet gnocchi are created by hand by the chefs of Nuovo. Cook in salted boiling water for 1 minute or until desired tenderness. Drain, toss with your favorite sauce and serve. Ingredients:water, dehydrated potato, canola oil, salt. Made in a facility the produces wheat, egg, soy, milk, seafood, pine nuts based products.